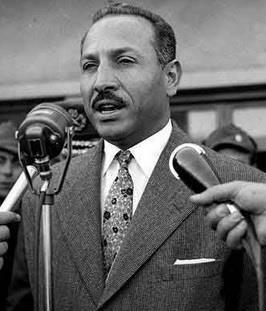 Abdel Latif Boghdadi or Abd el-Latif el-Baghdadi (20 September 1917 – 9 September 1999) (Arabic: عبد اللطيف البغدادي‎) was an Egyptian politician, senior air force officer, and judge. An original member of the Free Officers Movement which overthrew the monarchy in Egypt in the 1952 Revolution, Boghdadi later served as Gamal Abdel Nasser's vice president. The French author Jean Lacouture called Boghdadi "a robust manager" who only lacked "stature comparable to Nasser's." The two leaders had a fallout over policy in 1964 and Boghdadi withdrew from political life, although he amended ties with Nasser before the latter's death in 1970. Boghdadi was born in El Mansoura on 20 September 1917. He is known to have excelled at Egypt's military academy in 1938 and, later on, its air force academy. He rose to the rank of wing commander in the Egyptian Air Force and was sent by the Egyptian government under Mustafa el-Nahhas to fight alongside the Arab Liberation Army (ALA) at the onset of the 1948 Arab–Israeli War, prior to the arrival of the Egyptian Army. 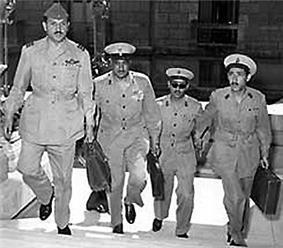 The Free Officers in Cairo, 1952. Boghdadi is shown on the left next to Nasser. He later became one of the original ten members of the Free Officers Movement. During the 1952 revolution led by the Free Officers he commanded jet fighter units to circle Cairo to prevent possible outside interference in the coup against King Farouk. After the movement assumed power, Gamal Abdel Nasser—a principal leader of the coup and Prime Minister of Egypt—made Boghdadi chairman of a special court established to try members of the old regime, sentencing former general Sirri Amer and a Wafd party leader Fouad Sarrag Eddine, among others, to long-term prison sentences. Most sentences were commuted, however. ^ a b c d e f g Pace, Eric. Abdel-Latif Baghdadi, 81, Partner in Egypt's 1952 Coup New York Times. 11 January 1999. ^ a b c d e All the revolution's men Al-Ahram Weekly. 24 July 2002. Abdel Latif Boghdadi: Diaries. (1982). Cairo: el-Maktab al-Masri al-Hadith. On 8 September 1999 Boghdadi was hospitalized for complications from liver cancer. He was pronounced dead at the age of 81 the next day. A state funeral for Boghdadi was held on 10 September in a Cairo suburb. The ceremonies were attended by Egypt's then president, Hosni Mubarak, and other high-ranking government figures. Mubarak issued a statement saying that Boghdadi had "served his country with devotion." In 1972, during Sadat's presidency, Boghdadi and nine other prominent former members of the Egyptian government sent a note to Sadat, criticizing his government for "over-dependence on the Soviet Union." Boghdadi opposed Sadat's peace treaty with Israel in 1978, as did all the other then-living former RCC members. As a result of the fallout, Boghdadi withdrew from political life, although the rift between him and Nasser was reconciled before 1970. In his memoirs, Boghdadi states that Nasser had planned to appoint him as vice president immediately before his death in September 1970, in order to prevent then Vice President Anwar el-Sadat's succession to power. According to Nasser's close associates, Nasser requested Boghdadi rejoin the government and become his second-in-command because he considered Sadat a liability. Due to Boghdadi's previous resignation concerning the close relationship to the USSR, he asked Nasser at first hand the nature of the new Egypt-Soviet informal alliance (which resulted after Egypt's decisive loss in the 1967 Six-Day War with Israel). They both agreed that Boghdadi visit the USSR alone to ensure there were not any differences in perception of what the new relationship between the two countries meant. Boghdadi submitted his resignation again on 16 May 1964, after disagreeing with Nasser's decision to send Egyptian troops to North Yemen to support his partisans in the civil war. He referred to the war as "Nasser's Vietnam." Boghdadi also wanted a more circumspect policy of "Egypt first." In response to his resignation, Nasser put Boghdadi's brother Saad under house arrest and prevented his brother-in-law from traveling to the United Kingdom to complete his doctorate. 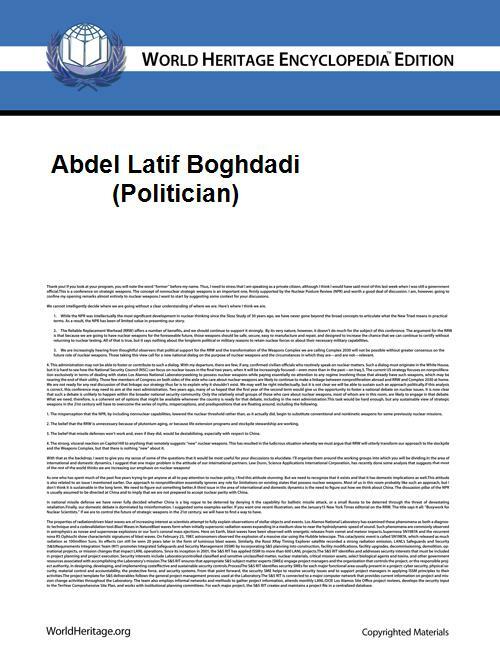 Nasser also claimed Boghdadi was implicated in illegal Muslim Brotherhood activities. 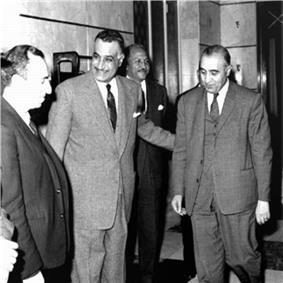 Boghdadi accompanied Nasser in his trip to Damascus on 24 February 1958, after recently uniting Syria and Egypt to form the United Arab Republic (UAR). His role in the new republic was, along with Amer, vice president of the Egypt province. In this period in the early 1960s Boghdadi held the additional post of planning minister. In 1962, shortly after the UAR's collapse, Nasser adopted a more Soviet (USSR)-style economic system for Egypt to which Boghdadi disapproved. He was utterly opposed to the extensive socialist measures and the new system altogether. He declared his resignation, claiming Nasser's behavior amounted to a loss of direction. Boghdadi also preferred closer relations with the United States (US), rather than the USSR. In 1963 Boghdadi warned Nasser about Amer—who's relationship with Nasser was particularly close, but eroding at the time—wiretapping his and Nasser's telephones, a situation which he blamed Nasser for allowing.